Research shows that goal-setting can increase productivity, especially when not accompanied by monetary reward. However, not just any goal-setting will do. If you choose the wrong kind of goals, or you apply them across every situation, you may end up hurting productivity rather than helping it. Do you know the difference between a SMART goal and an OKR? If not, don’t worry, we’re here to help you understand the two goal-setting methods and to walk you through which one might be right for your organization. The one commonality between the two is that they’re both simple. When it comes to goal-setting, simpler is better! Learn more with this goal guide from @InspireSoftware!Tweet This! First up, the SMART Goal. The SMART Goal elements are Specific, Motivating, Attainable, Relevant and Trackable. Specific: Instead of “Increase Traffic” try “Increase new user traffic on the homepage by 25% by October 30th”. Vague goals can cause harmful consequences and misunderstandings. Motivating: Motivation should be focus around whether or not the employee has autonomy or control over the goal. Is it aligned with meaningful values for that individual? Does it contribute to something greater? Does it provide opportunities for growth? The motivation an employee has to complete a goal will stem from these factors. Attainable: If you make goals unattainable, expect to have a discouraged and disengaged team. 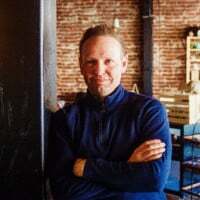 If the goal outpaces the team’s standard growth or productivity (without any increase in manpower or budget) then you should retool it to be a little more attainable. Relevant: Any goal you set at work should be relevant. However, sometimes managers feel the need to weigh-in with goals that are more about appearances than actual productivity. Before setting a goal that focuses on behavior rather than results, question whether it’s relevant to the task at hand. For example, take an employee who struggles with punctuality, but soars in tactical areas of their role. While you might want to set a goal about starting their shift on time, it might be more beneficial to productivity if their goals were more focused on increasing their managerial skills and learning additional strategic tools. Your organization will benefit more from the additional development and less from their arriving at 9 AM instead of 9:15. Trackable: Before putting a goal in place for yourself, an individual, or a team, make sure you’ve identified the baseline and put in consistent ways to track it. Increase site visits 25% by generating more online traffic through three LinkedIn ad campaigns during the holiday season. Train 90% of new associates to a Level 3 Competence in the Credit Application Process by the end of the second quarter. Score an average rating of 8.9 on our Customer Service Questionnaire (10 questions) to be given to 400 customers, twice over the next 12 months. SMART goals may take longer to set up in the beginning, but can be a helpful framework, especially for those working with goal-setting for the first time. It’s also simpler to train your fellow managers on goal-setting by using the SMART method, as it creates a standard enterprise-wide. Know the difference between SMART Goals and OKRs? Which works for your company? @InspireSoftwareTweet This! Now, let’s discuss OKR. Objectives and Key Results are a simple framework for defining and tracking objectives and their desired outcomes. A brainchild of technologists in Silicon Valley, OKR was born out of the agile movement. While there are measures built into many OKRs, the teams and companies who use them tend to view an OKR goal as a loosely defined target. While the objective is usually less specific than in the above SMART examples, the Key Results portion is exact. What is different about OKR goals is the roadmap between the Objective and the Key Results. Objective: Add 25% more salons to upscale salon chain. Key Results: Select 30 franchise candidates by June; train 15 of them before the year’s end; sign contracts with at least 10 before January of next year; open at least five stores by next June. Objective: Increase profit by 10%. Key Results: Implement new social media strategy to drive traffic to website with a 10% promotion for those who buy online; outsource marketing to save 20%; launch more aggressive campaigns during Mother’s Day and Valentine’s Day to hit last-minute male shoppers. OKRs work well in a company that already gives their employees a lot of freedom. Whether it’s workflex or simply the aforementioned agile processes, these companies tend to hire those who will fare better by selecting their own path to Key Results once the Objective has been defined. Whether you decide to start with SMART, or offer OKR, there are some hard and fast rules to setting goals you should consider. Failing isn’t always bad. Managers just starting down the path of goal-setting may become discouraged when their team, or an individual on their team, fails to meet a goal. While using OKRs, it important to remember, though, that they are meant to be more about reach and considered a success of you reach 60-80% completion. However, that feeling of failure may motivate them to try even harder to reach the goal to avoid that feeling in the future. If your goal is attainable, then consider encouraging your team to try again. Allowing employees to select their own goals may help. In many organizations, the manager selects and assigns goals to the employees. However, some research has shown that selecting one’s own goals may be even more effective. Either way, output can improve by up to 15% when goals are established. Write it down. Harvard conducted a study where they followed students who stated goals, who stated goals and wrote them down and who had no stated goals. While the students who had goals but did not write them down were earning considerably more than their non-goal peers a decade later, the ones who wrote down their goals were doing even better, earning, on average, 10 times as much as the other 97% of the class combined. Go beyond cheerleading. It’s very easy to have a goal-setting meeting and then never touch your goals again. But setting goals is more than saying you want something to happen. You must define your goals and create a plan in order to succeed. Work with your team to understand the motivation for the goal and how you’ll reach it together. Setting the wrong goals can backfire. Research shows it can lead to a too narrow focus, reduce cooperation in the workplace, increase risk taking and encourage unethical behavior. Get buy-in from your team before unilaterally implementing new goals, and make sure you have goal tracking in place. 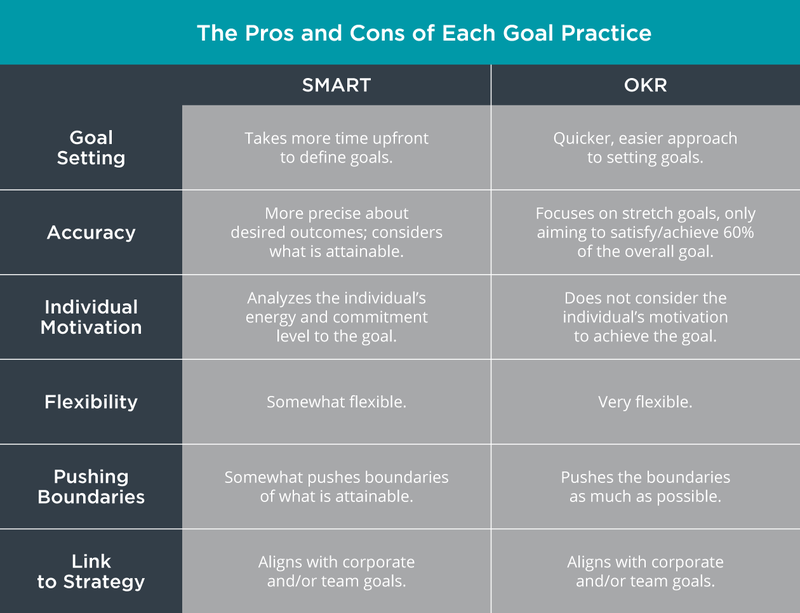 Now that you understand the difference between SMART goals and OKRs, which do you think you’ll use for your organization and why? If you want a way to set, track and achieve goals for your organization, check out our goal-setting guide!